Berkley Gulp Alive Minnows are a variety of soft, plastic fishing bait sold in buckets filled with a powerful fish attractant. Alive minnows are rigged and fished much like other soft plastics, then returned to the soaking solution in the bucket at the end of the day. On its website, Berkley claims the lures release a scent like a blood trail in the water, drawing in gamefish and promoting savage strikes. Gulp Alive minnows are sold in a variety of sizes and colors in bait, tackle and sporting goods stores. Remove the Gulp Alive bait from the bucket and seal the lid to prevent the other baits from drying out. Pierce the head of a Gulp Alive minnow with the hook barb, pushing the hook inward and deep into the lure. The barb should be turned downward so that it emerges from the belly with the tip point back toward the head. Tie the hook directly to the main line using a clinch knot. Instructions for tying this knot are linked in the resources section. Cast the Gulp Alive minnow toward the shoreline and around structures such as submerged trees, bushes and pier pilings where predator fish lurk. Retrieve the Gulp Alive bait with a steady crank on the reel. The natural design of the bait makes it flutter in the water like a real minnow. Dip the Gulp Alive in the storage bucket to submerse it in the fish-attractant liquid before each cast. This rejuvenates the bait and keeps it as fresh as a live minnow. 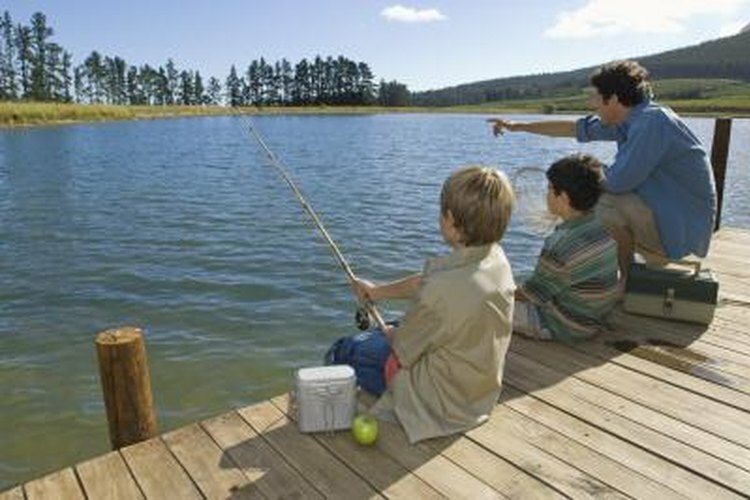 To save the lure for another day, remove it from the hook and place it in the storage bucket after fishing.